At Suburban Solutions, we understand how stressful moving can be. Trying to coordinate leaving one location and moving into another, arranging for utility transfers, and packing everything up can feel as if moving has taken over your life. That’s where we come in! Our professional movers have been helping customers move in Bensalem, PA for many years and are dedicated to providing the highest quality of service to each and every customer no matter what size the move and no matter how far away the move is. When our Bensalem, Pennsylvania movers arrive at your home, we will walk through of your home with you and find out exactly what you need done. We will disassemble any furniture that needs to be broken down and wrap all large pieces of furniture and appliances in shrink-wrap to make sure everything is protected. We provide this service at no extra charge. Once everything is loaded into the truck, it will all be secured down to prevent movement of any boxes or furniture in order to protect from damage or breakage. Speaking of trucks, all of our Bensalem, PA movers have vehicles that are well maintained, regularly inspected, and thoroughly clean. Suburban Solutions also provides moving services to companies who need to move the location of their business. We will do an inspection prior to your move of both the location you are moving from and the location you are moving to in order to evaluate any issues that may arise, such as moving equipment through doorways, entrances, and elevators. 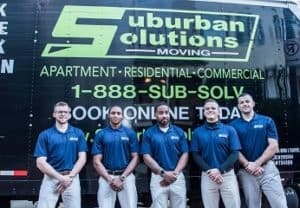 Whether your company is an office, retail, or any other type of business, you can count the Bensalem, PA movers from Suburban Solutions to help every step of the way. Many of our customers also take advantage of our professional packing and unpacking service. We provide all packing materials including boxes, bubble wrap, and packing tape and will carefully sort through, pack, and mark each item you are bringing to your new location. We will also unpack everything and remove all packing materials after the move. For those customers who decide they would prefer to do their own packing, we have all the supplies you need. We carry a variety of box sizes, all constructed with heavy-duty cardboard. We also carry packing tape, bubble wrap, and packing peanuts. Everything you need all at one location. Moving can provoke a broad range of emotions ranging from excitement, to stress, and everything in between. Packing and moving your belongings can take several days and then there will be other tasks such as turning off your utilities, closing subscriptions, cleaning, and so forth. To make your life easier, you might want to consider taking advantage of a moving company like Suburban Solutions. Perhaps you’re unsure about whether or not you want to spend the extra money on a moving company. In general, if you can relate to the following, it may be in your best interest to turn to professional movers. If any of these things apply to your situation, we at Suburban Solutions have you covered. As a moving company, we can make your move as easy and efficient as possible. No matter where you are moving, let our professionals take care of the tasks you don’t want to handle on your own. As a leading moving company, we’ve moved thousands of people into new homes throughout [location]. Whether you are moving into a larger family home, downsizing into a condo, or are completely changing your scenery, we can help. As soon as all of your belonging, and junk, is cleared out of the house, let our team of cleaners scrub everything from top to bottom. This not only saves you on time, but also might help you to ensure you get your deposit back (if applicable). For a quote regarding your upcoming move, please call our moving company today. Suburban Solutions is the company Bensalem, PA calls when they want dependable movers. Our moving team is committed to providing each and every one of our customers with the utmost quality of service. Each member of our team is a dedicated employee. Our movers from the Bensalem, PA team are all trained in the best practices of moving so you can be sure the movers who walk through your door are seasoned movers with extensive experience. Call the most trusted movers in Bensalem, PA today, Suburban Solutions, to receive a no-obligation quote and find out how we can take the stress out of your move!